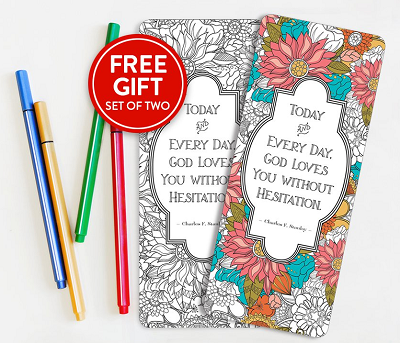 Request your FREE Coloring Bookmarks today – while supplies last. Featuring an inspiring quote from Dr. Charles Stanley, this set of bookmarks will spark your creativity. So grab your markers and colored pencils, and color to your heart’s content. Send the second one to a friend so they can join the fun! Limit one set per household. While supplies last. Offer available to addresses in the United States, Canada, Australia, New Zealand, and United Kingdom only.